Northern Cardinal 2/7/2012 So sweet. 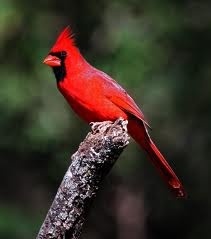 The Northern Cardinal is mainly granivorous, but also feeds on insects and fruit. The male behaves territorially, marking out his territory with song. During courtship, the male feeds seed to the female beak-to-beak.